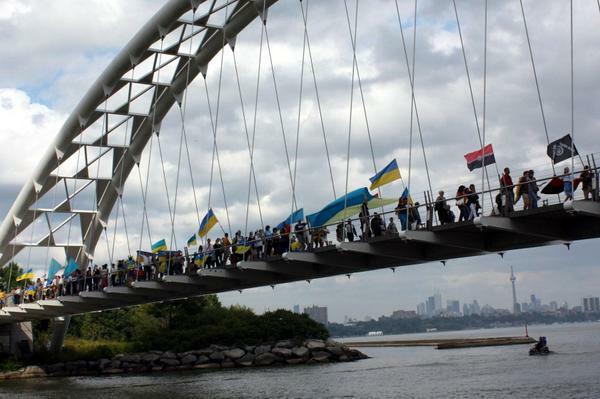 The right-wing Canadian government endorsed a "Ukrainian Independence Day" celebration in Toronto that openly raised funds for the fascist Right Sector organisation and at which the group's red and black flags were displayed prominently. September 18, 2014 – Links International Journal of Socialist Renewal -- Just under 25 years ago, the Cold War ended with a capitalist triumph. The nationalised economies and political structures of the Soviet Union and eastern Europe collapsed and a transition to a harsh, anti-social capitalism began. In the years that followed, an eastward expansion was undertaken by the North Atlantic Treaty Organization (NATO), the military alliance of the imperialist countries of Europe and North America. Many of the countries of eastern Europe joined the alliance, in explicit defiance of agreements by NATO with post-Soviet Russia not to expand in this way. A generation later, the world finds itself at the outset of a new cold war. It is directed by the same NATO military powers and its aim is similar: to stop any advance of anti-capitalist social revolution and to constrict and contain Russia. The difference from the conditions of today to those of post 1990-91 is a large one. Russia is no longer offered a pretense of partnership in capitalist Europe. On the contrary, the Russian Federation is being vilified and sanctioned with a goal to its subordination, marginalisation and eventual dismantling. There are several reasons for this shift in attitude to Russia from the end of one cold war to the beginning of another. For one, capitalism’s ongoing economic and financial instability requires new sources of investment and plunder. The vast territories and resources of the Russian Federation are enticing targets for capitalist investors. There is less tolerance by the big imperialist countries for middle-power competitors such as Russia, China and Brazil. For another, social and political conditions in Europe and eastern Europe are more explosive than they were 25 years ago. Reliable police officers are needed to keep rebellious workers, farmers and youth in check as they resist the harsh, economic austerity policies or violations of national sovereignty by imperialist countries. Events in Ukraine have soured whatever cooperative attitudes that may have existed toward Russia’s leaders, particularly over its decision to facilitate the secession vote in Crimea in March that saw the region opt for political association with Russia. The imperialists expect Russia’s leaders to act in the fashion of Egypt’s military rulers, who faithfully police the Palestinian rebellion. But Russian leaders are prepared to stand up for the country’s capitalist interests and elite. They do not control the rebellion in eastern Ukraine. While they are willing to keep it in check, as evidenced by the recent ceasefire agreement that robbed rebels of a better outcome, they are not prepared to stand by while the rebellion goes down to bloody defeat. Left and liberal opinion in the world is ceding to the NATO drive, agreeing that, yes, there really is a “problem” with Russia. The consequences of this can be far reaching. Three newly published articles show the vastly differing ways in which left and liberal opinion is reshaping. The vital article among the three is an essay by Daniel Lazare, published in Jacobin magazine on September 9. Much of it is an analysis of the 2010 book by author Timothy Snyder, Bloodlands: Europe Between Hitler and Stalin. Lazare describes Snyder’s book as part of a rising “double genocide” movement that equates the Holocaust and other atrocities of Nazi Germany with the violent repressions of the Stalin regime in the Soviet Union in the 1930s. He argues that a flawed conflation by contemporary writers of these two distinct, historical experiences is serving to downplay or even justify Nazi atrocities. These are presented as unfortunate but understandable responses to the repressions of the Soviet Union under Stalin. An added twist by Nazi apologists is to slyly observe that many of the Stalin regime’s henchmen were of Jewish origin, the message being that left-wing Jews in the Soviet Union bear responsibility for the rise of Nazism. Contrary to Snyder, the problem is not a Russian push to the west, but an American drive to the east that has only intensified since Euromaidan. While the State Department argues that a democratic wave is sweeping across Eastern Europe, the claim is belied by the mass disenfranchisement of Russian-speaking minorities, the growing Baltic identification with the Third Reich, and the exaltation of [WW2-era Ukraine fascist Stepan] Bandera in places like Lviv and Kiev. The rapturous reception that [Bloodlands] received in the mainstream media is a sign that intellectual resistance to America’s drive to the east [beginning with the collapse of the Soviet Union in 1991] has all but collapsed. With only a few exceptions, mainstream English-language media in Europe and North America has been silent on the rise of extreme, right-wing nationalism in Ukraine, including the role of the extreme-right militias that are fighting alongside the Ukraine army in the east of the country. The horrific humanitarian consequences of Kyiv’s war have likewise received scant attention. A second, recent article is “On the left or in Russia? The strange case of foreign, pro-Kremlin, radical leftists”. Written by Toronto academic Stephen Velychenko and published on the multilingual website Thinking Ukraine, the article sharply criticises various left-wing publications for publishing articles critical of the Kyiv government. Ukrainians might prefer the EU to the Russian variant of neo liberal capitalism because experience has shown them the latter is more destructive and rapacious than the former. Russian-style neo-soviet capitalism as exists in Ukraine is not tempered by a strong left opposition, trade unions, independent political parties and rule of law -- what Marx considered the “bourgeois rights and liberties” established in Europe between 1789 and 1914. Velychenko’s claimed benefits of western European capitalism will be news to the peoples of Greece and elsewhere in southern Europe who are struggling against harsh austerity regimes or the people of Scotland where the “yes” side of the September 18 referendum is propelled by anti-austerity sentiment. The idea of a benevolent, capitalist order in Europe that can offer a modicum of progress for the people of Ukraine was at the heart of the now-dormant EuroMaidan movement. It’s a cruel deception. Velychenko denounces a list of publications or organisations that he calls “pro-Kremlin” and “anti-Ukrainian”, including Borotba, Liva, Counterpunch, Green Left Weekly, Links International Journal of Socialist Renewal, The Bullet, Stopimperialism.com, Left/East and Canadian Dimension. He could have added a lot more names to his list of renegades, such is the impressive list of publications that see through NATO’s propaganda war. These include Jacobin, Truthout, Democracy Now!, The Real News Network, Consortium News (Robert Parry), Code Pink (Medea Benjamin), The Nation, Common Dreams and occasionally the London Review of Books, New York Review of Books and the Guardian (Seamus Milne’s columns). Velychenko refers to a “newly elected government in Ukraine” under attack by Russia. But there is nothing “newly elected” about the Kyiv regime. The president of the country was elected in May, but the country’s parliament is the same group of representatives of Ukraine’s economic elite that was in power when the previous, elected president was overthrown in February of this year. The only change has been the banning of the large Communist Party contingent. This is one of the many, new measures against freedom of expression (inspired by Europe!) that have accompanied the war in the east, including the new law which authorises police to shoot on sight anyone suspected of conducting “separatist” activity, killings of journalists and harassment of news outlets. The high-water mark [of Snyder’s acclaimed writings on the Ukraine crisis] came in mid-May when Leon Wieseltier of the New Republic (owned since 2012 by Facebook billionaire Chris Hughes) tapped Snyder to serve as the lead speaker at a five-day conference it was hosting in Kiev. Entitled “Ukraine: Thinking Together,” the conference featured such luminaries as Paul Berman, Timothy Garton Ash, Bernard Kouchner, and the irrepressible Bernard-Henri Lévy lecturing on “la résistible ascension d’Arturo Poutine.” The Yale historian had emerged as intellectual leader of the war party. The Fourth International political association has recently provided us, albeit inadvertently, with a timely warning against embarking upon the slippery slope of new Cold War, anti-Russia propaganda and prejudice. It comes in the form of a short interview with Zbigniew Marcin Kowalewski, editor of the Polish edition of Le Monde diplomatique. Kowalewski is a frequent source of analysis on Ukraine for the Fourth International. This latest interview appears in the September 4 edition of the bimonthly, Swiss FI publication solidaritéS and is reprinted in other Fourth International sites, including the website of the Nouveau parti anti-capitaliste (NPA), the French affiliate of the group. For Kowalewski, the pro-autonomy, self-defence movement in south-east Ukraine is nothing but an “armed, separatist movement led by extreme, right-wing Russians”. In a lengthy article published on June 29, like the aforementioned Velychenko more recently, Kowalewski uttered barely a word of Kyiv’s war and NATO’s threats and ambitions in eastern Europe. Do events in Ukraine confirm the views of the internationalist left which favours forming an antiwar alliance? The war is, on one side, an armed rebellion by a section of the Ukrainian oligarchy combined with a war of aggression, more and more direct and massive, by Russian imperialism. On the other side is a war of national defense and national unity (defense of national independence won just 23 years ago) by a people desperately seeking a way out of their long standing national oppression. It’s not possible to find a way out in a bourgeois regime subordinated to western imperialism. Ukraine has an urgent need for a socialist program of national defense. The international left has done nothing to contribute to the elaboration of such a program. On the contrary, we have seen a neo-Stalinist and neo-campist degeneration of an important part of this left that has passed over to the side of Russian imperialism. If we could have an alliance against the imperialist war of Putin, then yes. But an alliance against the war of national defense of the Ukrainian people would be an alliance of support to Russian imperialism and the separatist rebellion of the oligarchs. Signs of NATO’s renewed sense of purpose in eastern Europe are all around us. A gala event to raise money for “humanitarian relief” in Ukraine took place in Toronto, Canada on Sept 11. The keynote speaker was Prime Minister Stephen Harper. His speech was an occasion to beat the drums of war, including likening the self-defence fighters in eastern Ukraine to the terrorists who attacked the World Trade Center in New York on September 11, 2001. Harper said, “In the 13 years since the Twin Towers, the Pentagon and United Airlines Flight 93 were attacked, we have confronted terrorism in one failed state, only to have it surface in yet another [Ukraine]”. The Toronto event was attended by the cream of the Conservative Party political elite. Also on hand was retired hockey superstar Wayne Gretzky, who has a distant lineage to Ukraine. Harper announced that Ukraine President Petro Poroshenko would pay a state visit to Ottawa on September 17. That visit will see Canada formalise more military and financial assistance to Poroshenko’s regime. Last month, Harper’s minister of multiculturalism, Chris Alexander, was among the Ontario political elite attending a “Ukraine Independence Day” celebration in Toronto that featured a fundraising booth of the Right Sector fascist organisation of Ukraine. Alexander rebuffed a journalist questioning his presence at a fundraising event for fascism and war in Ukraine. Ontario Premier Kathleen Wynne delivered an aggressive speech to the event in favour of the war in eastern Ukraine, then in full swing. Contrary to NATO pseudo-denials, the Ukraine government is affirming that NATO countries are proceeding with replenishing it with arms. Australia, too, is boosting military equipping to Ukraine. The political left has not sufficiently analysed the expansion of globalised capitalism and how this contributed to the conclusion of the first cold war and dismantling of the Soviet Union. Now there is a new cold war upon us and we must play catch-up to fully grasp the events of the past 25 years. Russia has emerged as a capitalist power. It aggressively defends its commercial and territorial interests. But it is not an imperialist country and its foreign policy reflects this fact. The actual course of Russian foreign policy during the post-Soviet period is consistent with a second-rank capitalist power acting defensively, with caution and restraint, in the face of heavy pressures and provocations by the imperialist powers. The forms of the national oppression of the Ukrainian people have shifted since 1990. Whereas they suffered a deep oppression historically at the hands of the Russian empire and then the Soviet Union, the main source of that oppression now emanates from Europe and North America. This year’s brutal war has divided the country unlike anything during the past 70 years and the austerity policies that underlie the war are deepening. Meanwhile, the country’s post-Soviet economic elite have utterly failed to protect and promote Ukrainian language and culture or fashion a meaningful national project. There is an urgency for progressive forces in the world to understand the origin of the new cold war and act to oppose it. Key themes of a solidarity movement should be “No to war and austerity in Ukraine!”, “No to sanctions and other threats against the people of Russia”. On September 16, Ukraine’s Parliament approved the economic association agreement with Europe proposed Ukraine’s billionaire class. An analysis the loan agreements and austerity measures that accompany this agreement is penned by US economist Michael Hudson. There are dozens of Marxist or quasi-Marxist groups in the world claiming the title of “Fourth International”. The Fourth International was an international association founded in 1938 in an effort to create a stronger foundation for those Marxists who survived and opposed the rise to power of the Stalinist dictatorship in the Soviet Union. The “Fourth International” referred to in this article is the remnant, centred in Europe, of the Fourth International groups that reunified in 1963 under the positive impulse of the Cuban Revolution of 1959. An article by Fourth International leader Murray Smith making similar arguments to Kowalewski is published in the online journal of Die Lenke party in Luxembourg. The article is reprinted in the Quebec, online weekly, Presse-toi à gauche on September 2. Smith writes forcefully that the rise of fascism and right-wing extremism in Ukraine is greatly exaggerated. Meanwhile in Sweden, to name only one European country, the far right made huge gains in the national election of September 14. The Sweden Democrats party scored 13.2 per cent, up from 5.7 per cent in 2010. It is now the third largest party in Sweden’s parliament.